Jeff, I think the enclosed steel cab would look great. Yeh Jeff, where are the updates? I know it's cold up there, we would think you are in the train room. cold is not the word I would use to describe the temperature it is here, that would sound too warm. It is right at 0� F (not C) at the moment and getting colder. Anyways, I have not been posting much because I have been trying to stay off the computer as much as possible, I got a bad case of tendonitis from doing 60-70 hours a week in it since June. Good news is I am finally back to normal hours, and your right, too cold to be outside so it is back to the basement....sort of. I rented a shop space to work on cars through the winter, it is not much but it is heated. I spend a couple days a week working on the 1970 Nova and the 1949 Chevy pickup, the goal is to drive both home next summer. As far as the RR goes, I am just getting ramped up on it. I started to work on getting a operating system in place. I made some car cards and some waybills and had my first "one man" session to test it out. So far all is going well but it did not take make long to realize that I need another caboose, a few more flat cars, a gondola, and a couple more box cars. I also needed one more track at the coal dump trestle, which is now called "Thayer". I new when I planned the layout I was going to need that track but I wanted to see if I could do without. I am in the process of adding it and I will show where I put it when I get it done this week. I also made some mock up structures. The purpose of the structures was to see how they will fit the scene and to see how they will effect operations. The building I was most concerned about was the company store. After I build a mock up of the actual company store on the Manns Creek I realized that I needed one that a bit smaller, actually a lot smaller. On my trip with Brian Bond he showed me some structures he believed were old stores, and they sure looked like it. One of the stores we saw looked like it might be just the structure I needed. I found an old Model Railroader article that had drawings for a store of very similar proportions, so I photocopied it and made a scale mock up. It fit the space but the height sure changed the way the town felt and it blocked a good amount of the runaround. I am going to keep it there for a while to see how it works out with a guest before I build it. I also saw a few small company houses on my trip with Brian so I build a couple to see where I might put some houses. 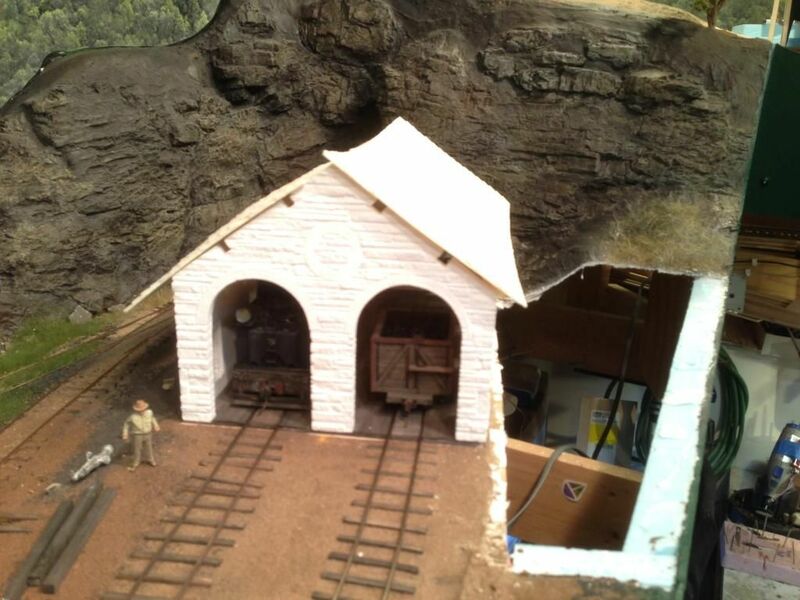 the last two mock ups I build were the mine tipple and the strip coal tipple. for the strip coal tipple I used the Manns Creek, although it was too long for me so I shortened it by half. It still looks too big so I might just use it as inspiration and make one that better fits the space. For the mine tipple I used the Woodvale tipple from the East Broad Top RR as inspiration. The Woodvale tipple was a shaft mine so I modified the tipple to look more like a typical drift mine. I love how tall the tipple is and all the different roofs and bents. 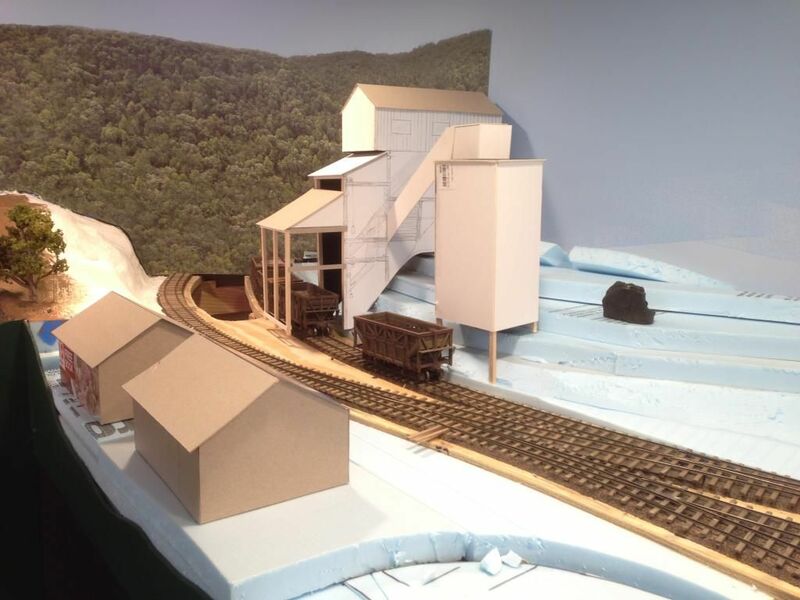 I added the wooden storage silo from the Manns Creek #7 mine tipple to model, so far I like it and plan on keeping it. here is the mine tipple and two company houses. there will be more company houses on the other side of the tracks as well. If you decide to use the MR plan for your store in the location shown, you might want to leave the porch/balcony off to reduce the footprint and make it less vulnerable to operators' arms. Great to see you posting again. Working on two major car overhauls with tendonitis must have been painful. Don't forget to post a few updates. I think of your projects every time a Nova turns up on "Fast & Loud", and I am interested in seeing the final finish on the pickup. You say you are adding track due to operating considerations. Are you going to use your hidden track to operate the layout? Are you adjusting the volume of traffic on the railroad, or is that "set" by your car inventory and siding capacity? My impression of your mocked up scenery and buildings is that you are going to have very compact scenes with all elements pushed very close to the tracks. I would exaggerate the grades to help justify why everything is so close together ... steep everywhere. The company houses in the last photo could be built on stilts on a steep grade falling toward the fascia, Then you could model all the junk up under the house. Some company houses in West Virginia had chicken coups underneath. As of now traffic is totally limited by car inventory, however I am building a few more flat cars and a gondola to help get some traffic flowing. I purchased a set of those Bachmann On30 side dump cars (like the ones you have) and I converted them to On3, I am going to use them in rock service. 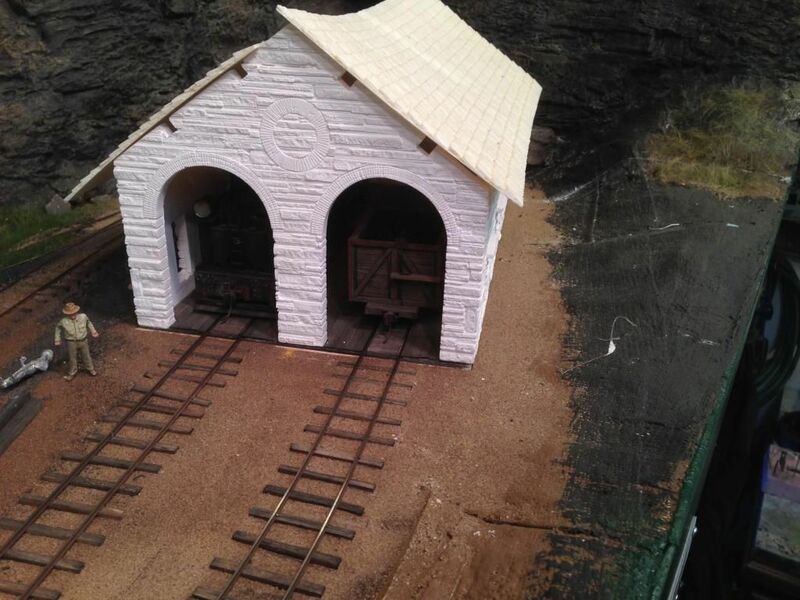 I added a short siding next to my engine house to store small cars, like the rock cars. I knew I needed the track but I liked it not being there, now that it is in I like seeing all the short 4 wheel cars sitting on it, and with a bunch of junk scattered around it will have a nice look. I really like the look of that mine tipple mockup! Thanks, it looks a little more substantial since it is solid, but all those shaded lines are timbers and the bottom will look more open and airy, however it will be filled with chutes and cables so I think visually it will a good scene, I can't wait to build it. This was one of the tipples I was going to make actually load but after operating the layout a few times I really have no reason to make them actually load. First off, the prototype did not use a locomotive and crew to pull cars under a tipple to load the cars, the RR dropped off empty cars and the tipple either used gravity to move the empty cars or a car puller. Second, operations actually work better if I load all the hoppers before the session and then have an operator only have to unload and return them, which is more than enough work for an operating session. I have 17 hoppers built and an operating session will start with 13-15 hoppers loaded at 5 different loading points. The session starts by drawing mine request cards, which I have a stack that is shuffled. The cards basically tell the operator how many empty hopper cars the mine is requesting to be spotted for that days loading. Depending on the locomotive each empty train is limited to 5-8 empty hopper cars. A coal train crew will leave the dump trestle area with a locomotive and all the empty hoppers that are at the trestle (might only be one or two cars), then it will proceed to the mine area and fills out its allowed down hill limit of loaded cars, and places whatever empties it brought. I have cards for each locomotive that dictate how many loads it can handle down hill (which I base on the size of the locomotive and the quality of its brakes, sounds good to me). The loaded train heads down to the dump trestle and unloads, then it takes those same empty hopper cars back to the mine to satisfy the empty hopper request with the hoppers he just emptied. Then he goes and gets more loads from a different tipple (s), goes unloads them, and spots them depending on the empty request. so you can see that working tipples really actually would not make the switching as fun because all you would have to do is haul up some empty hoppers, load them (which would be fun once or twice), then go unload them. What is lost is the switching when you use working tipples because you could load your train all at one tipple. And again, that is not how the prototype typically would have loaded coal hoppers. On the prototype you have mine carts being hauled out all day and they were dumped into the hoppers, a very slow process. To create more switching about 1 out of 8 loads state that it has to be dumped at the coke bin instead of the sizing plant bin. At the beginning of a session when I load the cars will coal I place a load card in the car card slot and it states with unloading shed to dump into. After an operator builds his train and goes to the dump area his train may have five cars for the sizing plant and one for the coke bin, so he will proceed to dump the cars in the sizing shed and skip the car that is going to the coke shed, then he has to pull out that car and dump in over at the coke bin. It might seem a little odd that a specific load would be picked for the other bin but I will make up some reason for it, however the real reason is to just make some interesting switching. I finished adding the new track in the area I now call Thayer. 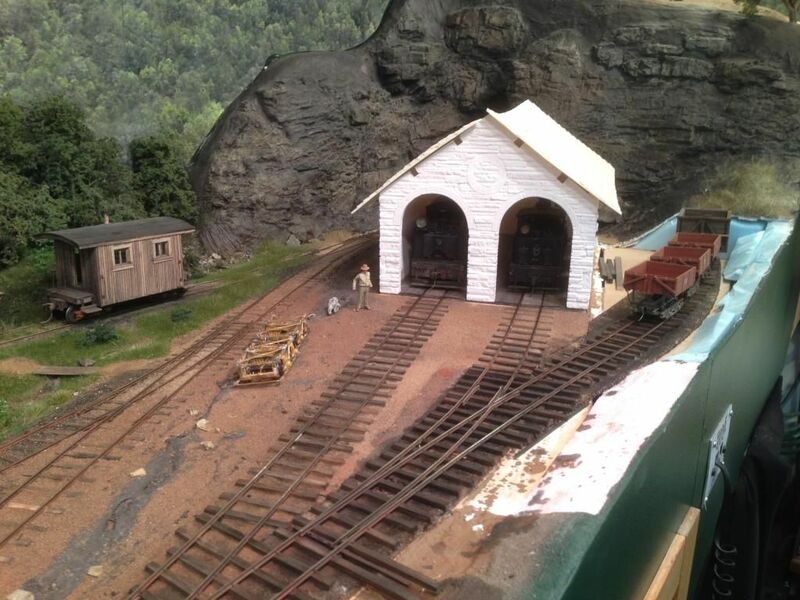 The new siding was installed next to the engine house and will be used to unload parts and to store empty small cars, like the small 4 wheel rock cars. With all the track in and operational I have started to set up an operating system / schedule for my layout. 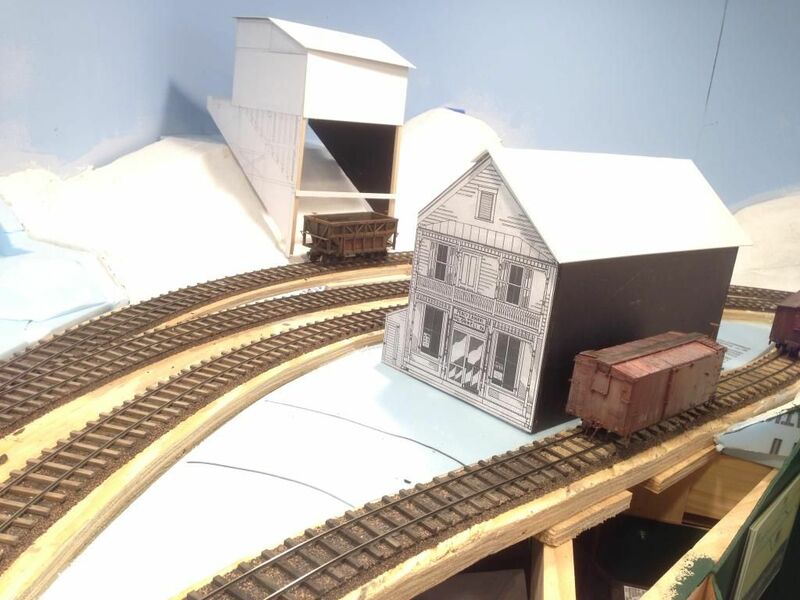 I always think it is good to start operating a layout before structure and scenery building gets too far. Once a layout starts operating you see some things that need changing and you don't want to build something that won't be able to be used or scenery that has to be torn out. I had a local model railroader over that used to operate my HO layout to see what he thought of my new layout. It has been almost five years now that my HO layout has been torn down and nobody local have come over to see what I have been building. 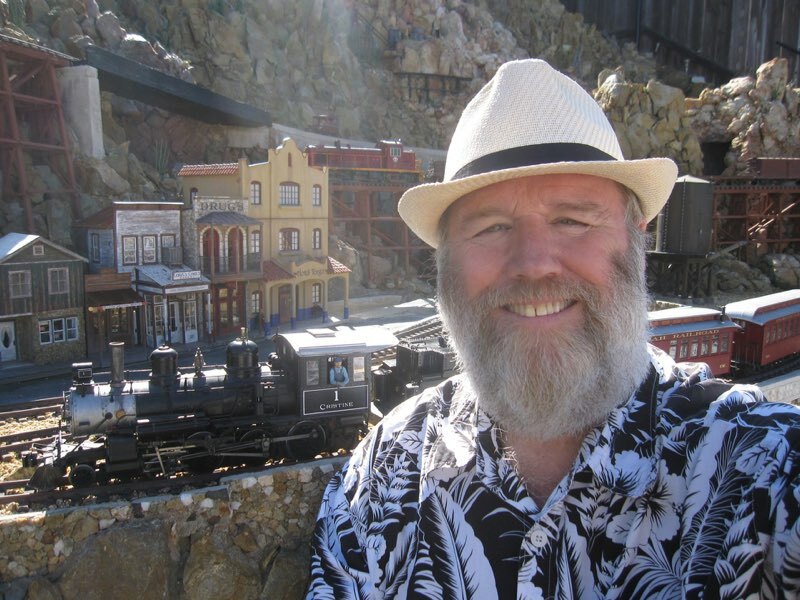 There is almost zero interest where I live in narrow gauge, especially O scale, at least no body I know. Anyways, from his visit a few things became apparent. I had planned from the start to use stationary decoders on all my turnouts. All of my turnouts are controlled by tortoise switch machines with "The Hare" decoders. I got very used to throwing the switches with the handheld throttle, and I liked the clean fascia of the layout and it seemed easy to me. However, since I built the layout I was very comfortable with the track layout, the way the TCS Wow decoders worked, and the way the hopper cars operated I never saw how overwhelming it would be to someone that did not know how it all worked. After his visit I decided to install local panels to not only show the town diagrams but also to control the turnouts. I noticed that "the Hare" decoders have the option of local control using either a toggle switch or a momentary push button. The push button feature is pretty nice, just push the button and the switch throws, push it again and it throws back. The Hare also allows for LED throw indication. I thought that a really clean installation would be to have a LED bi-color push button. I searched everywhere for what I was looking for and I could not find something small and cheap. I finally settled on a single color LED momentary button from Digikey, which I took a chance on it that I could convert it to what I wanted. I bought all the buttons I needed and sure enough, a single 3mm LED was used to light the button. I then ordered a bunch of 3mm bi-color LEDs and modified all the buttons. I cut an 1/8" thick sheet of acrylic, printed out a track diagram and built this neat and small switch panel. 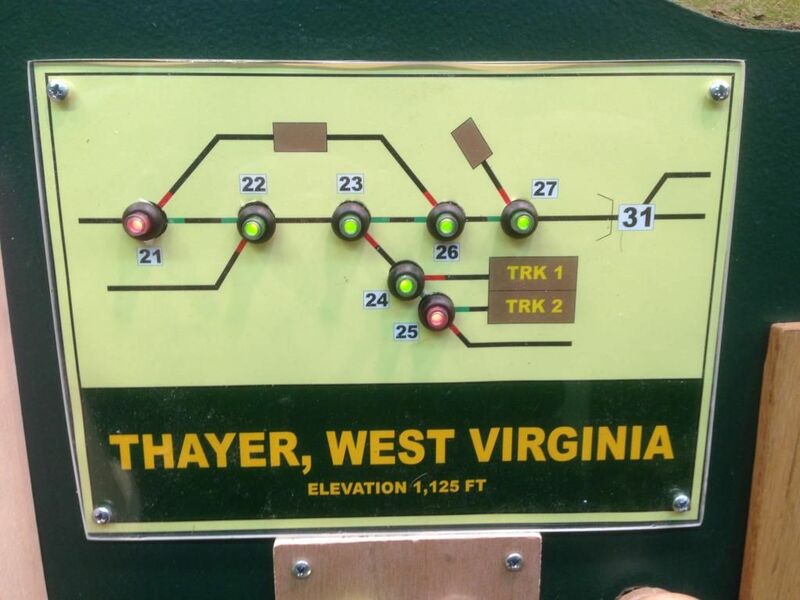 On the track diagram I color coded what route the turnout would be set for when depending on the color of the button. I figured most people could guess that green meant the closed route, and red the thrown route, but the colors will make it even more clear. I cut an 1/8" thick sheet of acrylic, printed out a track diagram and built this neat and small switch panel. On the track diagram I color coded what route the turnout would be set for when depending on the color of the button. I figured most people could guess that green meant the closed route, and red the thrown route, but the colors will make it even more clear. I still kept the turnout number so the turnouts can be thrown from the throttle. I think it is great that you are responsive to the needs of operators. Unless I miss my guess, your layout will probably be operated solo by you alone at least 90% of the time. And, if you settle down to a small group of operators to invite over to run trains, they would learn how to deal with almost any situation over time. Berret Hill: http://www.berretthillshop.com/ I know Kevin Hunter and have seen these toggles in action. Intuiswitch: http://www.intuiswitch.com/ A friend is installing these on his On30 layout. I am looking forward to seeing how they work. anyways, Mark, I looked at both those options and they are really nice, but I already invested and installed those Hare decoders and they have the terminals for the push button and LEDs. My cost per turnout with the modified Digikey button was under $3, and it takes about 5 minutes to modify each button, no soldering required. I do plan mostly solo operation but I will have a guest over every now and then so I want them to feel comfortable and enjoy it, and I know that for some people they don't want to think too hard about running trains. I figure you saved yourself around $10.00 per switch, so I will definitely be getting back with you on the specifics of your indicator push buttons. As for it being simple for visitors to run trains on your layout ... I think the process of running trains will be pretty simple; the empties go up the hill, the loads come down. No need for a lot of paperwork. What you might want to avoid is allowing a visitor to hurry through the job. Using a lot of momentum and the brake feature in the TCS decoders will be not be "simple" for a visitor, but I think that is a good thing. It will force them to pay attention to what they are doing, which is one of the main reasons for operating in the first place.